DESIGNED AND MANUFACTURED BY THE COMPANY THAT BRINGS YOU FIRE MAGIC PREMIUM GRILLSAmerican Outdoor Grills are made with a stylish sleek appearance. The rounded hood and contoured face feature a satin finish that enhances any outdoor kitchen. The AOG grill is constructed from the finest commercial-grade stainless steel and features a large cooking surface with stainless steel rod cooking grids and sleek analog thermometer for precision grilling. With its recessed backburner, warming rack, spit rod and motor, the American Outdoor Grill allows you to create any meal outdoors. Available in 24", 30" and 36" widths. 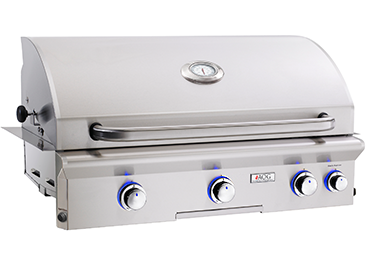 ​The new “L” series grills feature an electronic push button ignition system that does not require batteries. It also includes interior halogen lights (controlled by a push button located on the right side of the unit) ideal for evening grilling. Requires 120 Volt AC power.